When your catalog printing page count gets higher than 60 pages it’s time to consider perfect binding. A perfect bound catalog printing project has a square spine and the pages are glued in place. The continuous plastic coil is available in a wide range of colors and sizes. 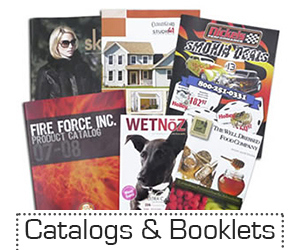 The finished catalog will open up and lay flat and the plastic coil binding is very durable. This form of binding behaves much the same as plastic coil binding, except that metal wire is used instead of plastic.